Screwpull innovation and engineering have given way to timeless lever-driven designs as functional as they are groundbreaking — including the Original Lever, developed from the very first Screwpull lever model. Screwpull's legendary smooth lever action is based on the idea of mechanical advantage. As pressure is applied at one end of the lever handle, power is multiplied at the corkscrew, making it easier to open the bottle with one fluid motion. This corkscrew is not meant for use with synthetic corks. Le Creuset, the manufacture, guarantees the Screwpull Lever Model for ten years from the date of purchase against defects in materials and workmanship. This guarantee does not cover normal wear and tear, maintenance, or the consequences of abuse, or commercial use (e.g. in a restaurant or bar). You will find details enclosed about limitations, cleaning and the need to replace the screw occasionally. Where can I get replacement screws for the Le Creuset lever style corkscrew? Thank you. Where do I buy the replaceble screw and for how much? where was the le creusset corkscrew manufactures? I have one that was made in France, and it is excellent. I want to buy another corkscrew for a friend. BEST ANSWER: This corkscrew is available on the website. Le Creusset does not have a physical store of it's own. IS THIS MADE OF METAL OR COMBINATION METAL AND PLASTIC? IF THE LATTER WHICH PARTS ARE PLASTIC? 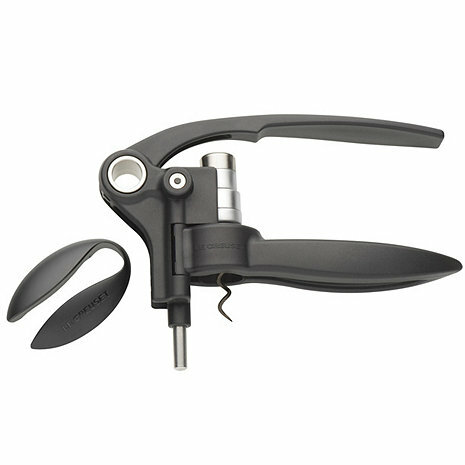 BEST ANSWER: The Le Creuset Lever Style Corkscrew Gift Set is made from both plastic and metal. The black parts are plastic – the screw and foil cutter are metal. What is included with the LM-2000? BEST ANSWER: Thank you for your question. The LM-200 consists of the corkscrew along with a foil cutter. It is packaged in a black gift box. Any other questions please call us at 800-356-8466. I recently purchased this to replace a 5 year old Screwpull LM-300W. While the LM-200 is priced similarly, it simply does not compare. The LM-200 is a cheap, flimsy imitation, and stopped working after opening two bottles. I do not recommend it. bought to replace the exact same one that lasted about 10 years. amusingly, I found the receipt under the foam in the box of the old one; had I found it a few weeks earlier I might have had a warranty claim. I've owned mine for well over ten years and still going strong. This one is a great gift for a friend. The ease of operation over other lever corkscrews is exceptional. Even my wife can operate it. Works great! Much better than my old one. Only negative was that my order took weeks to be delivered. We tried to replicate an old wine bottle opener we've used for years from Rogar. The salesperson sent us a similar one that fell apart almost immediately. We then listened to her and order this on, her own favorite. It's the best one yet. Works great. Wish it had a stand so it could be left out to be easily accessible.